Even the fussiest eater will love these Honey Almond Butter Granola Cups. It’s hard to resist their crunchy outer oat shell and creamy honey almond butter filling topped with a dollop of sweet jam. They’re the good-for-you snack that will have them coming back for more, plucking the mini cups from their snack bag until all that’s left is a few rogue flecks of coconut and bits of oats. Don’t be surprised if your kiddos want to eat these on repeat, week after ever-loving week during the school year. Thankfully, they’re easy to make. I made these Honey Almond Butter Mini Granola Cups with the kiddos in mind. What child doesn’t love a mini treat filled with creamy goodness? But, the fact is, adults love mini treats, too. These have quickly become my favorite go-to snack. I find myself stealing one or two from the container quite frequently. This recipe is extremely versatile. Once you make the granola cups, you basically fill them with whatever you have handy. Roasted almond butter spiked with sweet honey is my favorite, but you and your kiddos might prefer peanut butter. The wonderful thing about honey is that it pairs perfectly with just about everything. You could even fill the granola cups with a little honey-sweetened Greek yogurt and top them with fresh fruit to create a quick and wholesome breakfast option. However you decide to fill your cups is up to you. There’s no harm in putting your own spin on the recipe. 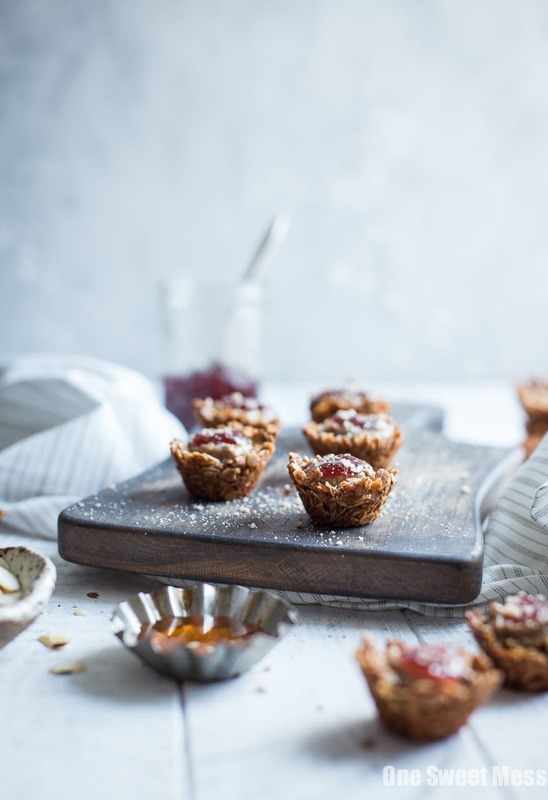 Either way you decide to dish up these Honey Almond Butter Mini Granola Cups, they’re guaranteed to be devoured. Preheat oven to 325 degrees F. Spray 2 nonstick mini muffin tins with coconut oil. In a large bowl, add oats, almond meal, coconut, cinnamon, and salt. Stir to combine. In a small bowl, whisk together melted coconut oil, ¼ cup honey, and vanilla extract. Pour the mixture over the oats and fold to combine, making sure the oat mixture is evenly coated. Fill the mini muffin cups with 1 tablespoon of the oat mixture, pressing down firmly with the back of the tablespoon to create a shallow depression in each cup. Bake for 15-18 minutes, or until the cups are golden brown. Remove from the oven and allow the cups to cool for 10 minutes. Using a butter knife, gently run the knife around the cups to release them from the mold. Allow them to cool completely on a wire rack. In a small bowl, mix almond butter with remaining 2 tablespoons of honey. Fill each cup with a scant teaspoon of almond butter. Top with a small dollop of jam. Store in an airtight container in the refrigerator for up to 7 days. Disclosure: Thank you to the National Honey Board for sponsoring this post. All opinions are 100% my own. Thank you for supporting my site while I work with brands I use in my kitchen. A. That adorable breadboard, where did you get it? I LOVE the colors! B. This recipe looks amazing. D. Anyone who describes themselves “whisky wielding” is automatically my best friend. These are such a great idea!! My daughter would LOVE them! What a great little snack! They are gorgeous! My kids will go nuts for these!! I LOVEEEEEEE honey and almond butter together! And I love that you made granola into cups! This is such and ADORABLE and DELISH snack! !